FAQ - Ellipse Security, Inc. Most orders will ship the same day they are ordered. If a product is back ordered or takes some time to prepare, we will contact you in order to inform you of the delay. How quickly will my order be delivered once it has shipped? Standard UPS Ground shipping will be 1 to 5 days in the continental US. Optional shipping methods, such as 2nd day or next day air can get your order to you sooner. In addition to UPS Ground shipping we also offer UPS 3 Day Select, 2nd Day Air and Next Day Air Shipping. We also ship vis USPS and Priority Mail. Yes! Shipping to Canada and US territories can be done directly through our website. In order to ship to other areas please call or email us. Do we offer free shipping on any products or on entire orders? We often offer free shipping on certain products and have coupon codes for free shipping on orders as well. These offers are offered only for limited time periods, so act quickly when you see them! Our Return Policy and RMA form can be found HERE. Items generally may be returned within 30 days for full credit. Products returned after 30 days may be subject to a restocking fee. All parts, cords, manuals, etc. must be returned in original packaging in re-sellable condition. Products returned with missing parts or in unsellable condition will be subject to a restocking fee. Product must be packaged properly to avoid shipping damage. No returns after 60 days. Generally, security cameras can be broken down into two main types, IP and HD. Both are used for surveillance, recording and storing video, and remote viewing over the web or mobile devices. IP Cameras and HD (High Definition) Analog Cameras make up the overwhelming majority of CCTV or Surveillance Camera Installations today. In general, IP Cameras are devices that are viewed over a network and currently allow for higher resolutions. HD Cameras are easier to deploy, more affordable and do not require any networking knowledge. What is an IP or Network Camera? A Network Camera or IP (Internet Protocol) camera, is a type of digital video camera commonly employed for surveillance, and which, unlike analog closed circuit television (CCTV) cameras, can send and receive data via a computer network and the Internet. IP Cameras are capable of the highest resolutions in security cameras available today. Because of the network format, IP or Network Camera are much more capable of convergence with other Technologies and Integration with other security aspects of a network. This means they are very versatile in the way they can be set up. For instance, an IP camera could be setup alone, connected into the existing local network of a home or business. Those on the local network can access the camera through a browser or other software and see the image coming from the camera. If the camera has built in storage, such as an SD card, they could even go back and review past footage. In order to centralize the IP cameras to a single storage device a Network Video Recorder (NVR) is used. An NVR is a network device with a large hard drive (HDD) that is setup to record all of the IP cameras on the local network. Some NVRs even have a built in network switch so that they can be installed much like a normal surveillance system with the cameras connecting directly to the NVR instead of routing though the existing network. IP cameras are capable of high resolution video, as of the writing of this article up to 12 Megapixel or 4K Resolution (August, 2017). 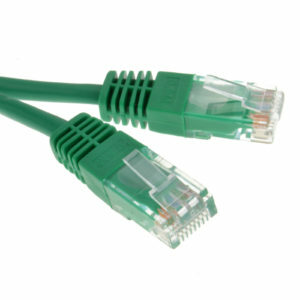 The cables used for these systems are the same as those used in any modern computer network, CAT5e or CAT6. Some consideration has to be taken into the capacity of an existing network to support the transmission of high resolution video. A high performance power-over-Ethernet (PoE) switch is a necessity and often one of the more expensive parts of an IP system. The complexity and costs associated with IP systems can be off-putting to residence and small businesses, but for installations with large numbers of cameras IP is the best option. HD Analog or HDCCTV was born out of traditional Analog CCTV and is capable of high resolutions up to 4 and 5 Megapixel as of the writing of this article (August, 2017). HD Analog technologies have come on strong in the last few years as they have seen great improvements in resolution while keeping the affordability and ease of use that was available in traditional Analog. HD Cameras use common BNC or Coaxial Cabling to deliver the signal from the camera to a DVR (Digital Video Recorder). There are currently several competing HD Technologies including: HD-TVI, HD-CVI, AHD and HD-SDI. Except for HD-SDI, all of the other HD formats allow for extremely long transmission distances, some up to 1600 feet. AHD CCTV Cameras: AHD CCTV is an Analog High Definition closed-circuit television video surveillance standard that uses coax cable to transmit HD video from security cameras to DVRs. AHD supports 720p and 1080p HD video resolutions. AHD has gained market share considerably since its entry into the HD Analog Market. HD-CVI Cameras: HD-CVI stands for High Definition Composite Video Interface. This is a brand new technology in the security camera industry that provides a different method of transmitting video signals over coaxial cables. Until this and other new technology surfaced, analog CCTV video was limited to 960h video resolution. HD-SDI Cameras: HD-SDI or High Definition Serial Data Interface was one of the first HD Analog Technologies. Although this format allows for the most bit-perfect images, transmission distances are very short without expensive additional equipment. HD-SDI has not taken hold like other HD technologies as it lacks many of the benefits of HD while remaining much more expensive. SD Analog Cameras: Cameras on modern Analog CCTV systems send their video in the traditional base band format over coax cabling back to a digital video recorder (DVR). Here, video is digitized and stored on hard drives. This technology was the standard for many years dating back to VCR’s and Multiplexers. Analog or CVBS has evolved into the Modern HD Analog formats and systems. Since many Analog Systems were installed using COAX or BNC Cabling, they can be easily upgraded to HD by switching out the cameras and DVR. HD CCTV Systems use common BNC or COAX Cabling. This is the industry standard for HD and SD Analog surveillance systems and the vast majority of DVRs and Cameras will have BNC connectors on them. 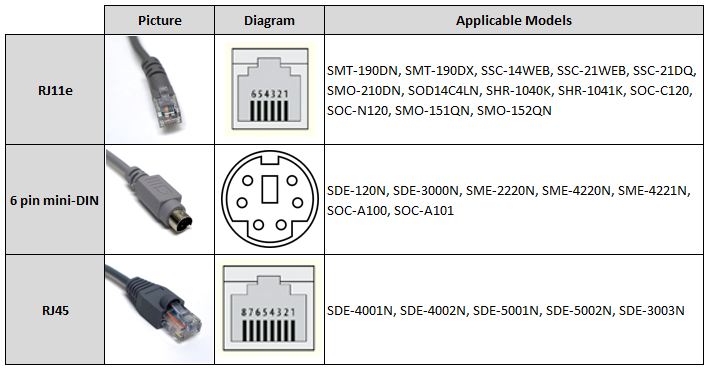 Some proprietary systems have used other connectors such as RJ45 and mini-DIN. Additionally, many installers like to use twisted-pair CAT5/CAT5e cable with RJ45 connectors adapted with BNC video baluns. CAT5/CAT5e is a common type of bulk cable and is also well suited for long runs when high quality baluns are used. Prior to adopting the industry standard BNC connection, Samsung’s plug-n-play, do-it-yourself systems used several proprietary camera cables. The first systems were RJ11e, which is very similar to the RJ11 cables used to connect telephones but different in that it has 6 pins instead of 4. They later moved to the 6 pin mini-DIN cable and finally to RJ45. Although similar in design RJ45 can be differentiated from RJ11e by the fact that the connector shell is wider and that it has 8 pins. DO NOT plug an RJ11e cable into an RJ45 camera, DVR, or adapter. It will physically fit but it creates a short circuit that can damage your equipment!